America was the land of opportunity to Mussa Schinasi and his brother Solomon in 1891. The young men hailed from Manisa in Asia Minor and conditions for the Sephardic Jews in Turkey had noticeably declined by the end of the 19th Century. New York City promised a new life. The young men arrived in New York via Alexandria, Egypt with no jobs but extensive knowledge of tobacco processing. They founded the Schinasi Brothers, Inc., a cigarette and cigar manufacturing company. Using imported Turkish tobacco rather than the Virginia-grown leaves American smokers were accustomed to, they produced cigarettes under the brand name “Natural” and before long were highly successful. Mussa quickly changed his name to Morris. 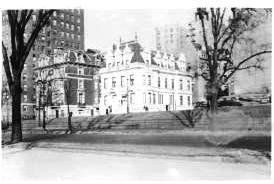 By 1907 both brothers both millionaires and Solomon purchased the red brick and white marble Isaac Rice mansion on Riverside Drive. Morris, the same year, hired architect William Tuthill to design a new mansion at Riverside Drive and 107th Street. This one, like his brother’s, would be free-standing as were several other of the enormous Riverside Drive residences. The article was right. Tuthill. 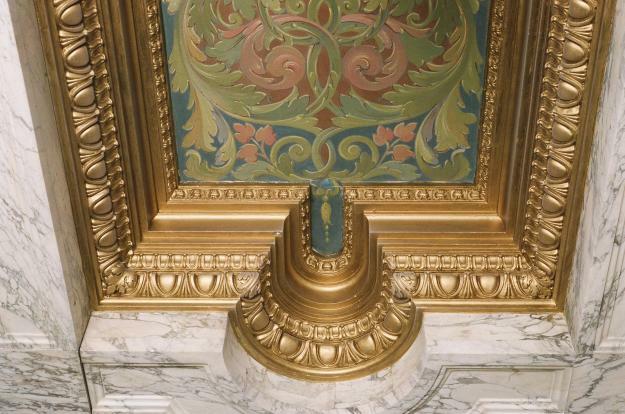 who had been trained for several years in the offices of Richard Morris Hunt, produced a French Renaissance palace of blinding white Vermont marble. Two and a-half stories high, it boasted sophisticated stone balconies, a steep tiled roof and conspicuous projecting dormers, along with picturesque cresting and finials. The house was completed in 1909, a year after construction began. In the large sitting room the acquaintance remembered “heavy ornately carved furniture and thick wall hangings.” There was a deep oriental rug on the floor, a piano, and a jazz-playing Victrola. 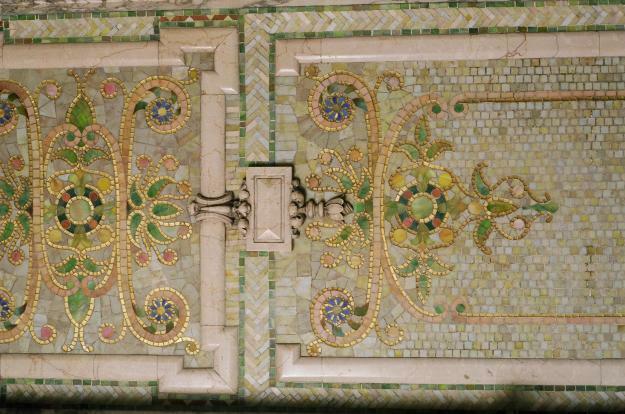 The library was adorned with carved teak panels, imported from India by the Associated Artists; the decorating firm founded by Louis Comfort Tiffany and Lockwood de Forest, among others. Ceilings were frescoed, walls were marble-paneled and staircases and other woodwork intricately carved. In the basement, a tunnel led below ground to the Hudson River. While contemporary architecture critics praised the structure, Schinasi himself was apparently not so happy. Although by 1911 the brothers would own two cigar factories and were multi-millionaires, Morris Schinasi refused to pay Tuthill for his architectural design work. Morris Schinasi died on September 10, 1928 leaving an estate of about $8.5 million. Among the charities in his will, he provided for the construction of the International Morris Schinasi Hospital in his homeland of Manisa. Two years later the family sold the mansion to the Semple Realty Corporation for $200,000. Mrs. Rosa Gunter Semple moved in and established the Semple School for Girls in the house; a finishing school for well-bred young ladies. It was here in her rooms that Mrs. Semple died at the age of 93 on October 10, 1956. 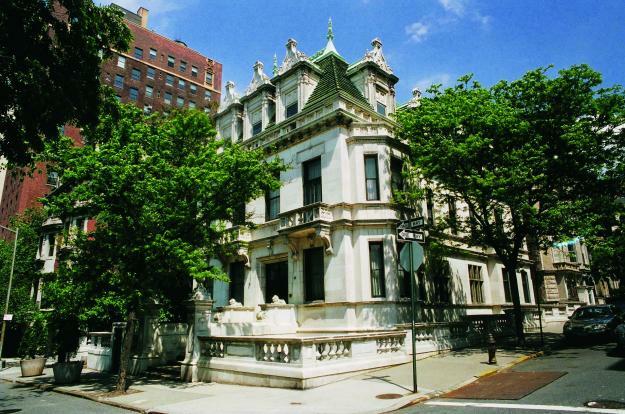 The home became a day care center for Columbia University in 1960, “The Children’s Mansion.” When the school decided to sell in 1979, Columbia law professor Hans Smit and his wife, Beverly, purchased it for a reported $325,000. Smit initiated what would become a two-decade interior restoration. The carved oak newels with their pineapple and tobacco leaf motifs, the mosaic wall details, and the parquet floors came back to their 1909 appearance. That intriguing tunnel to the Hudson River, however, remained sealed. In 2006 the couple offered the mansion for sale at $31 million; and after going on and off the market for several years, the last privately-owned free-standing mansion on Riverside Drive was relisted in 2011 for $24.9 million. The house was designated a New York City landmark in 1974. I am an architect doing research on 351 Riverside Drive. Anything you can enlighten me about the mansion - pictures, plans, condition during your grandmother's time at the school would be most appreciated. very interesting to know about Rosa's brother. thanks for the information about your family. I attended Semple School for Girls in 1956-1957. The class of English for Foreign Students had only 3 students, two girls from Venezuela and me.